When considering a shed for your garden it’s important to ensure you do your homework. With many choices available to you it’s very easy to buy on price – and price alone. This can be a very bad decision, certainly if you want to have a one that’s going to last. 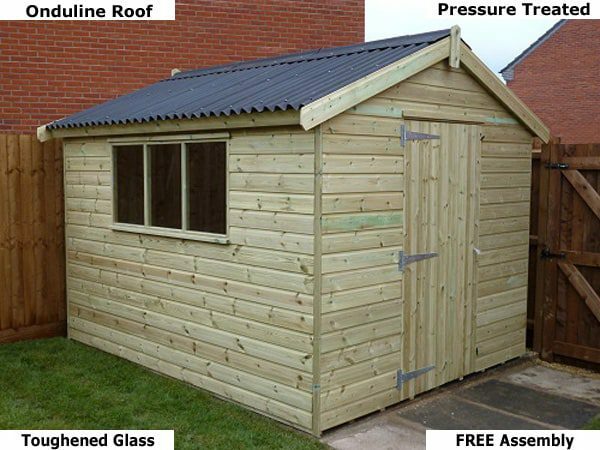 This is why you should consider seriously this Platinum Titchfield shed which is based on the Platinum workshop range. They boast T&G redwood timber throughout, they have the superb Onduline roofing, all the cladding, framing and floor are fully pressure treated and which comes with an expected 15 years freedom against rotting. And besides all that, they are erected FREE of charge. How good is that? Please Ask About Bespoke Options.